Kiss My Wonder Woman: 'Daredevil' Asks Us, What Does It Mean To Save A City? 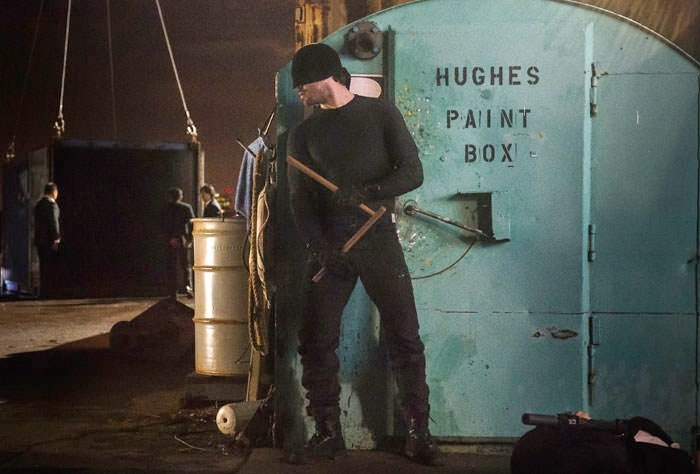 'Daredevil' Asks Us, What Does It Mean To Save A City? So last week when I wrote my initial review of Daredevil, I'd only seen the first five episodes, as I pointed out in the article itself. Now I've seen all thirteen, and while I stand by my preliminary belief that it's a really good freaking show, now there's a bit more nuance to my analysis. Having seen all the episodes, I feel like I have a better grasp of what the writers and actors and directors were trying to say, and I like the show even more for that. Because Daredevil, as far as I can suss it out, isn't really a superhero show in the same way that Arrow and Agents of SHIELD are. No, it's actually closer in its philosophical leanings to more serialized dramatic shows, and in terms of the ambiguity of the questions it raises and the answers it refuses to give, I'd actually have to say that Daredevil shares more DNA with Parks and Recreation than it does with The Flash. I know, that feels really weird to say. But it is, I think, true. Daredevil isn't a show about superheroes, it's a show about people who happen to have superpowers, and that's a valuable distinction. 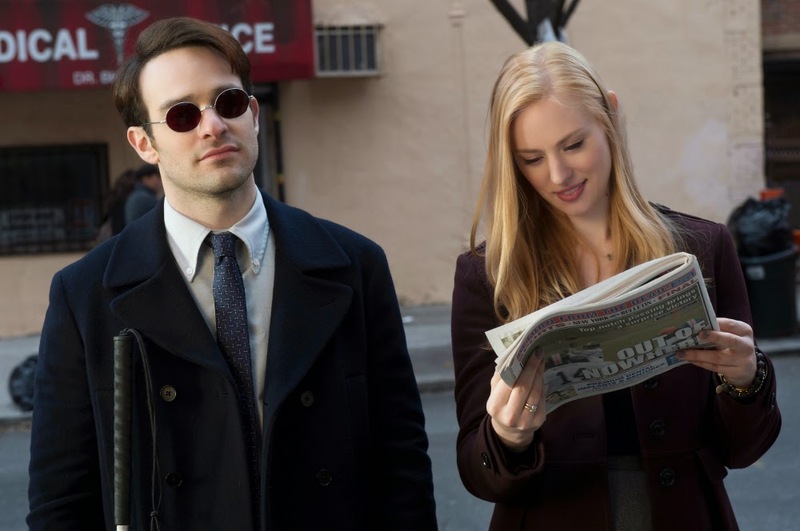 Mainly because, as is so rarely the case in shows like this, the actions that Matt Murdock takes in his daily life as a lawyer are just as important to the story as the actions he takes as the "Devil of Hell's Kitchen." In other words, it's not that he's a superhero with a secret identity, it's that Matt Murdock the person is full of secrets and hidden compartments, but his ultimate motivation is the same no matter what form he's in. And that motivation, as we know from so early on in the story, is to save Hell's Kitchen. What makes Daredevil a genuinely great show, however, is that the villain has the exact same goal. 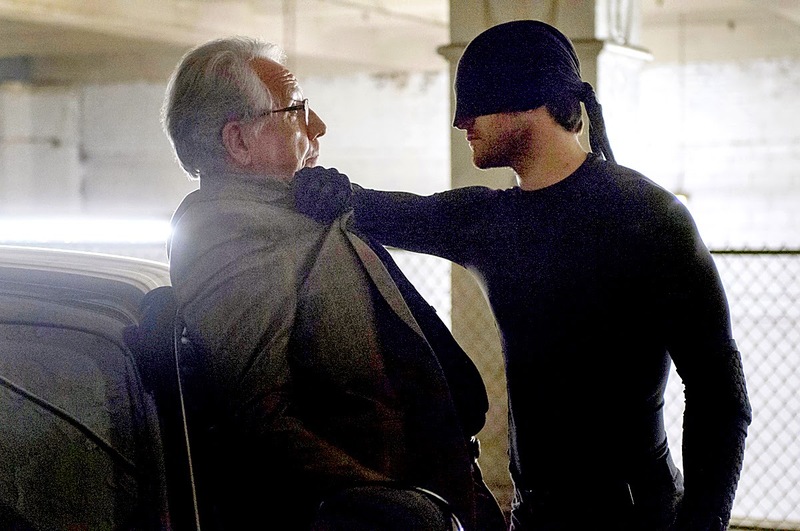 So, like most stories, Daredevil is only as good as its villain. 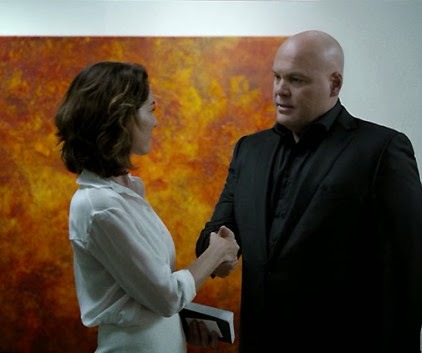 The villain in this show is Wilson Fisk (Vincent D'Onofrio), a shady backroom dealer who's actually a lot less shady and backroom than Matt Murdock (Charlie Cox) would like. Fisk is a criminal, sure, but he's a criminal whose goal is to convert the tenements of Hell's Kitchen, a region devastated by the "Battle of New York" in Avengers into high rise condos and a business sector. He's hardly committing mass murder or ruling an army of space orcs here. It would be easy to argue, as some critics have done, that the show suffers for this. That because Fisk's goal essentially boils down to gentrification the show isn't very interesting. Honestly, though, I find those arguments to be really insulting. Yes, Fisk's goal is to gentrify the Hell's Kitchen neighborhood. He wants to push out the low income families who live there and turn it into another gleaming borough of Manhattan. That's not a boring or non-dramatic goal to me. It is very literally a matter of life and death. See, what makes the show so compelling is that Fisk and Murdock both want to save the city, but they have utterly different conceptions of what it means to save a city. Murdock interprets that to mean that he should save the people of the city from the rich, powerful, and violent who prey on them, literally fighting off muggers and gang members in order to help the mostly low income people who live there. Fisk, on the other hand, sees saving the city as more of a matter of tearing down the old to bring in the new. He doesn't care about the people of Hell's Kitchen, he's there to make the city itself better. So to Fisk's eyes, a city isn't the people, it's the architecture? Streets? I don't know. I have a lot of trouble sympathizing with his point of view. But however you slice it, their end goals are both exactly the same and completely opposite. 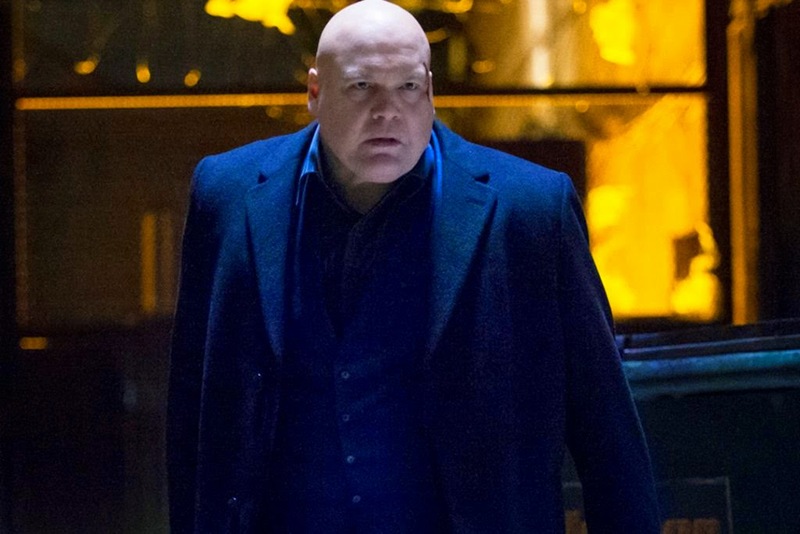 Murdock will consider the city saved when all of the people who live in Hell's Kitchen are safe and free to live their lives, and Fisk will consider it saved when all those people have been driven out of the city entirely. And all of this conflict, the conflict of the show, arises from these two different interpretations of what it means to save a city. Which is just plain good writing. But wait, there's more. Another important facet of the show is the sheer number of similarities between Fisk and Murdock as people. They are alarmingly similar men, though they prefer not to acknowledge that fact. Both men grew up in Hell's Kitchen and have strong emotional ties to it. Both men grew up with an overbearing, violent father and an absent or functionally absent mother. Both men were taught how to fight by their fathers and both men lost their fathers violently at a young age. Heck, they even both were raised with aspirations of class mobility, with Fisk's father running for city council in order to raise his family's standing and Murdock's father choosing to gamble on the outcome of his own fights in order to get Matt a nestegg. But this is pretty much where the similarities end. Because while Murdock's father was violent and overbearing, he was also loving. Yes, Jack Murdock was kind of a terrible parent - giving whiskey to a nine year old so his hands will stop shaking while he stitches up your face is not great parenting - but there is no question that he loved Matt and wanted the best for him. Fisk's father, on the other hand, was an openly abusive drunk who made his family so miserable that Fisk one day snapped and killed him. So they're a little different. And it's arguably this small difference between them that explains why they have such different views of the city. For Matt, while his father did die a tragic death, Hell's Kitchen holds good memories. He had people who loved him, and even if he was lonely, he was lonely in a loved way. He knows what it is be part of the community as a beloved member, not an outcast. Fisk, on the other hand, doesn't associate Hell's Kitchen with good people, he associates it with the desire to rise socially and the ostracism he faced as a result of his father's shortcomings. So he has no desire to save the people - they're all garbage to him anyway. All he wants to do is make the city that his parents wished they lived in. All of this adds a new light to Murdock's decision not to take a position at Landham and Zach but to start his own firm with Foggy. He doesn't like how Landham and Zach treats the people of his community, and he is much more committed to those people than he is to his own ambition or upward mobility. Fisk, on the other hand, is all about his own personal opportunity. 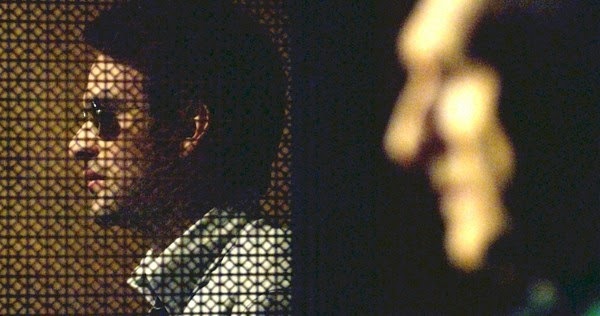 So while Murdock looks at Mrs. Cardenas and "sees" a neighbor, Fisk sees an apartment that needs to be vacated. Heck, even their choices of romantic partner are telling! Fisk falls for an art dealer with a codedly upper class European accent, a woman who appreciates fine wine and beautiful art and gorgeous suits, while Murdock's main love interest is a working class Hispanic nurse who fished him out of a dumpster. Okay. So, what does all of this have to do with why the show is awesome and amazing and great? Well, the reason we get so invested in this story, and why I'll fight anyone who calls gentrification a bad villain motivation, is because these are real questions that we really have to answer. What does it mean to save a city? Because here's the thing: there are a lot of cities that need saving right now. Like, most of them. While we didn't have a Battle of New York strewing alien garbage and debris all over us, the economic downturn has hit cities hard. We have an outbreak of police violence, protests all over the country, rising rent and rampant stories of corporate misdeeds. How do we save our cities? Is the answer to clean everything up, raise the rents, and make this is a nice school district? Or is it the harder answer? The harder answer being that we have to examine how we are treating our cities now and take responsibility for them. The Murdock way isn't to tear down a tenement and call it good to build a nicer building in its place. It's to care for the people who live there. Fund after-school programs. Sponsor an inner-city soccer team. Give business to the mom-and-pops in your neighborhood. To clean up your local park and say hello to your neighbors. Better yet, actually listen to them when they say hello to you. There's nothing inherently wrong with being poor, and low income families actually make great neighbors if you're not a jerk. But all of this takes effort. Saving a city by making it a community, that's hard. And frustrating. And exhausting. And wouldn't we all rather do something else with our time? Something more immediately satisfying? I, for one, love my city, and I want to save it. I don't want gentrification, but I do want a nice place to live. So I'm going to put my money where my mouth is and do something about it. I'm going to save my city. The hard way. And so should you. You know that Leslie Knope and Matt Murdock would be bros.